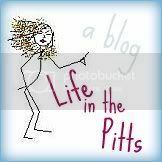 Life in the Pitts: I've been practicing like you wouldn't believe. Mmm I love deviled eggs. That picture is tempting my tummy! Lanie - you crack me up! Yes, I've eaten my share of those this week! Hey, thanks for your sweet comments on my blog! And, in answer to your question: Yep, I painted those blocks! =0) I know, your amazed, right? LOL! Have a great week. Come plant creative seeds at my party tomorrow....I see you have some really cute stuff you've been doing for your Etsy! Once my husband and I went to a picnic with about 100 other people there...everybody was supposed to bring something. We brought my special deviled eggs. 3 other people brought deviled eggs as well...but guess whose was gone within the first 15 minutes? Yep. If you want to make them really fancy, try adding some cooked, crushed bacon into the yolk mix...and a little bit of hickory smoke seasoning. Mmmmmm so good. OMG, I love deviled eggs. I made some for Easter and they lasted exactly an hour...totally gone. Now because you reminded me that I have hard boiled eggs still left, I just might have to make some more! They look so good. I think I need to make them more often then just the holidays! So how many? I have eaten so many hard-boiled eggs this week . . . As for deviled eggs, I could probably eat 3 halves.